Possibly the most infamous, this was the mod performed on the Marshall amp Slash used to record the blockbuster album Appetite For Destruction, released in 1987. The amp was an old beat up 1959T, the classic non-master volume Marshall with the added benefit of a useless tremelo function from an extra preamp tube. Since the tremelo effect was quite poor, a tech working at SIR (the rental company which owned the amp) named Tim Caswell decided to use this extra tube to add two extra gain stages, making the amp extremely gainy. The particular components used by Caswell are what contributed to the especially nasal sound you’ll hear from Slash’s guitar on Appetite For Destruction, and have made the mod difficult to replicate. Rumour has it that this amp was extremely desirable, and George Lynch reportedly paid a small fortune to be able to rent it for use on the Under Lock and Key tour with Dokken. 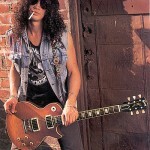 Slash loved it so much he tried to steal the amp, telling SIR it had been stolen, a plan that worked perfectly until one of his techies accidentally brought it to a band practice at SIR. The staff recognised the amp and took it back immediately! Jose was a famous friend of Eddie Van Halen’s, and when the buzz started to get really big around Van Halen, every guitarist wanted to know how to cop Eddie’s guitar tone. Eddie started telling journalists that Jose worked on his amps, generating his friend a lot of business. While Eddie’s #1 amp was actually mostly original inside, Jose did add a JCM800 style master volume to the back of the amp – this was later removed, and can be seen covered up in photos of the amp with a large screw. So although Jose’s mods on the EVH amp were minimal, the public demand meant that he had to satisfy people’s need for gainier amps. Many of the Jose modded amps featured an extra gain stage, and the installation of a new preamp tube to power an effects loop. The Jose mods have a certain character of their own, and are still performed by Mark Cameron who inherited all of Jose’s technical data after he passed away. Here is a particularly interesting modification, since Lee Jackson pioneered the system of enthusiasts modifying their own amps. Having designed custom amplifiers and mods for artists such as Steve Vai, George Lynch and Alan Holdsworth, he then released his own video instructing guitarists how to perform a Lee Jackson ‘hot-rod’ modification. These mods also used a 4th preamp tube for extra gain, and are notorious for sometimes looking as crazy inside as they sound! Okay Splawn mods aren’t technically an 80s mod, but they are a new company from the USA catering towards that ’80s Californian Modded Amp’ sound. They do both modifications to existing Marshall amps, and also have their own amp line based on Marshall designs. Splawn mods (or amps) have a really interesting and unique sound due to the way that they’re done, since they remove a redundant stage in the Marshall circuit known as the ‘cathode follower’ and turn it into an extra gain stage, and they also use a master volume that’s placed before the ‘phase inverter’, yet its a different design to what you usually see in an amp. Using one of these master volumes gives you a more natural sounding distortion at low volumes, but it changes the feel of the amp slightly and adds to the unique Splawn sound. One of the cool things about Splawn amps is that you can order their heads and cabinets in a wide range of tolex colours and patterns. Imitation snake skin covered head cab anyone? I’ve saved the craziest one for last. Remember when I said that Eddie Van Halen’s amp was mostly original inside? That’s because he had a huge resistor array hanging out the back, that was plugged between the amps output transformer! When I say this mod is dangerous, I mean it. The techie way of describing this mod is “putting a resistor between the OT Primaries”. The non-techie way of describing it is to say that basically, its like getting the two halves of the amp to kill each-other! Eddie Van Halen used to use this back in the club days on the sunset strip, in order to bring down the volume of his amp. While it does work incredibly well in making an amp quieter, it’s also why Van Halen I has a totally different guitar sound to all the other Van Halen albums; incredibly heavy sounding for an old Marshall amp. The reason it’s called the Cerrem mod is because that’s the username of a vintageamps forum member who spilled the details of the mod, he’s a tech who had seen Eddie’s amp personally and knew how this worked. There’s a photo of the resistor hanging out of the back of the magic Marshall somewhere on the internet, if you see it, now you know why! Mr Twistyneck is cool. Cerrem mod sounds killer to me. Splawns are cool. I like the variable cathode resistance set up.